Welcome to the Ethereal theme, a beautiful stunning Weebly theme. Create a website you can be proud to share with Ethereal. Now compatible with Weebly ​Carbon. Ethereal adapts to your business. With over 10 page types and layouts, creating a website you can be proud of is now easy. As an advanced responsive theme, Ethereal is mobile friendly and earns you a higher ranking in search engines such as Google. 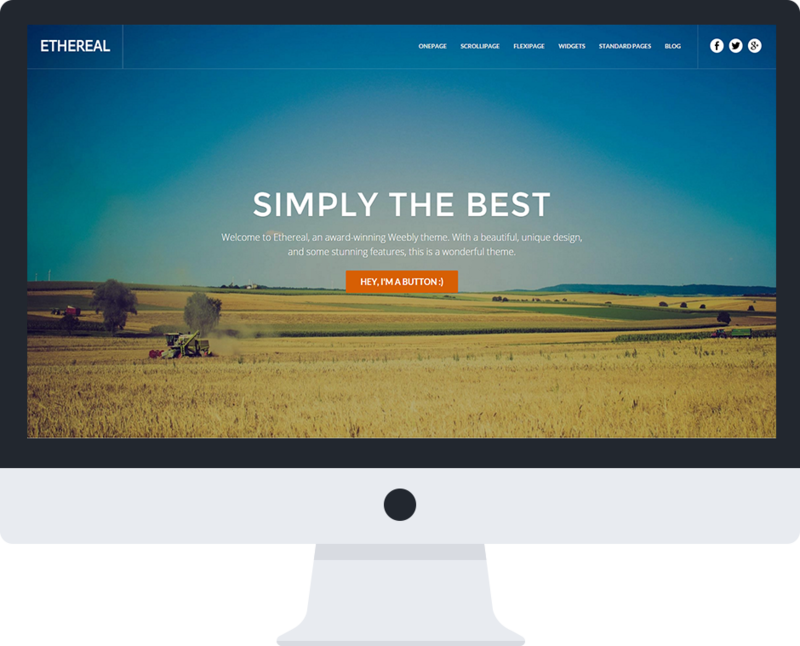 Ethereal is our first Weebly theme with powerful widgets! These are awesome, easy-to-use addons. Check them out here! Comes with several unique page layouts. Onepage is a unique page type in our Ethereal theme which combines imagery and parallax with regular colored sections, letting you organize your content effectively. Flexipage is a page type in our Ethereal theme that lets you drag 'n drop virtually any kind of element you'd like into the header of the page, giving you unlimited customization options. Scrollipage is a unique page layout with vertical scrolling, giving your visitors a refined, polished method of scrolling through various bodies of your site with ease & simplicity. ​Boost your business with Ethereal. It combines a clean, effective and modern design with powerful features and unique interactivity, allowing you to create the ultimate website for your business/organization. Plus, Ethereal is 100% compatible with everything that Weebly offers, from eCommerce, Blogging, Membership, Search, to even Weebly Carbon add-ons. The possibilities are endless. You can literally create any kind of website you'd like with Ethereal! I really like how your themes come with so many page layouts, really helps me when I'm trying to create a custom Weebly website. Thank you for your excellent theme!!! We've received so many compliments from visitors because of our new website!! I'm so glad that I stumbled upon Luminous Themes. I was just about to give up on Weebly, but then I found your website. WHY SHOULD YOU BUY ETHEREAL? 100% Responsive - The Ethereal theme will make your website look great on any device, whether its mobile, desktop, or even a TV. Special Page Layouts - Ethereal has many standard page types in Weebly, and three special pages such as OmniPage (you're looking at it right now), FlexiPage, and ScrolliPage. These special page layouts will help you create a unique, Weebly website very simply and easily. Very Easy To Use - This theme was designed for beginners and non-coders, with no technical skills required. Its very easy to download and start using. Everything is compatible with Weebly - This is a true Weebly theme. It installs into Weebly perfectly, and is 100% compatible with all Weebly features and plans. Use it across the free, starter, pro, and business plans that Weebly offers. Has Widgets- Ethereal is our first Weebly theme with widget compatibility! Check out some of the included widgets by clicking here. We design beautiful, high-quality premium Weebly themes that revolutionize websites around the globe. Upgrade your website today. Our themes are designed to work exclusively with Weebly. Everything works as it should, no fuss guaranteed. Buy a theme and see for yourself. We craft our themes with pixel-perfect precision, and only with the highest quality code. Being responsive, our themes adjust to the users screen.